Long before people started turning their yards into theme-park-caliber haunted houses for Halloween, a few of the more ambitious neighborhood decorators would put up a scarecrow in their yard or hang some white-sheet ghosts. As decorations and prop-making skills have become more elaborate, the sheet ghosts have given way to more lightweight, wraithlike apparitions. Discover the easy way to make your Halloween ghosts float or fly across your yard, porch, or wherever the spirits take you. If you're creative or feeling ambitious, you can make your own ghosts. Fine, Lightweight White Fabric that is almost transparent. A cotton sheet or solid white curtains will work, but visit the fabric store and find something that is sheer. Suggestions: Voile, cheesecloth, or gauze (it shreds easily) Depending on the number of ghosts, you will need at least 6 yards (2 yards+ per ghost)--extra is better. Mannequin Head or large round or oval-shaped styrofoam balls: lightweight is best. Glue Gun, Tacks, Pins, etc. Shepherd's Hooks or telescoping yard stakes, upon which the foam head or ball will be attached. Eyebolts: If you want to hang the ghost from a tree, porch, beam, etc., attach an eyebolt to the foam head or ball. Heavy-Duty Glue: Attach the eyebolt to the foam head with a strong glue like heavy-duty glue like E6000. Monofilament Fishing Wire: 12-pound will work; this is to hang ghost heads and fabric. Don't worry if you don't have the DIY chops or the time to make homemade ghosts. This tutorial focuses more on how to artfully hang or suspend the ghosts. You can save yourself some time and hassle by using premade ghosts. The good thing about buying ghosts is that they are all there and ready to go, allowing you to focus on your flying trickery. Assemble the ground stake (which usually comes with the premade ghost). Thrust the stake securely into the ground. 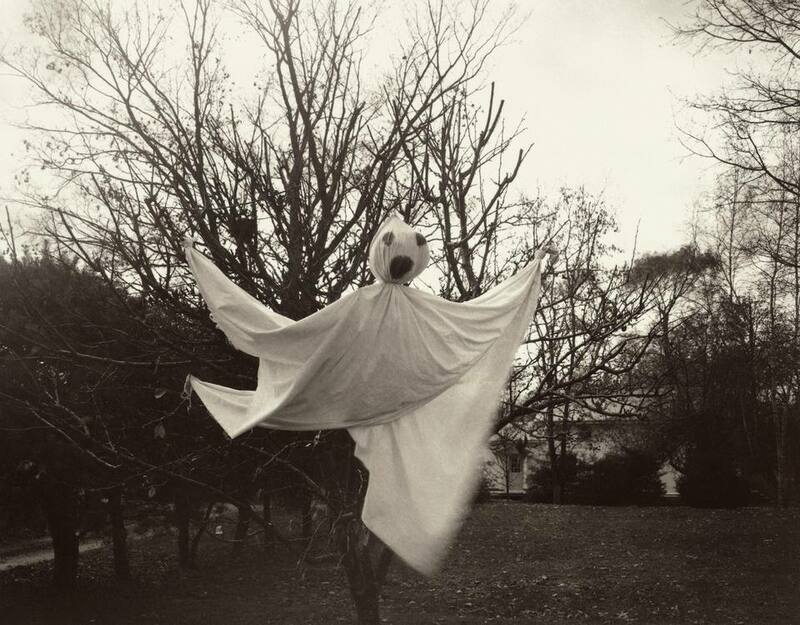 Doing so at an angle will give your ghost a less rigid, more flowing appearance. If this is a do-it-yourself project, then hopefully you will have chosen a fabric that is white, lightweight, and not stiff.. A plain white cotton sheet will do, but something more transparent will look "floaty" and be easier to work with. Besides cheesecloth, rayon or a cotton/synthetic blend would be good fabric choices. Moving right along, stretch out the fabric to its full length, then proceed to attach more-or-less in the center to the round or oval head of your ghost. You can affix it with a thumbtack, pin, use a glue gun, regular glue, or double-sided tape. Thread the 12-pound-strength monofilament (fishing wire or invisible nylon heavyweight thread) through a large embroidery needle. Carefully pull the needle through a corner of the fabric a few times, enough to make a secure knot when tugged or pulled lightly. Depending on how high your overhead support is, you may need a step stool or ladder to tie the monofilament in a secure knot to the tree branch or beam. Cut the short end of the monofilament/thread close to the fabric. With the other end that is still attached to the monofilament spool or reel, stretch it up and out toward your overhead support from which your ghost will be suspended. This might be an eave or beam above a porch or a tree branch. To get the ghost "arm" (corner of fabric) adjusted to the desired level, you'll need to play around with the monofilament spool before cutting and tying it. You may need to pull it out, raise it up, or lower it before it looks just right. Once you've found the perfect position for the ghostly arm or edge, tie it securely to the tree branch, eave, beam, or other overhead support. Tie it a few times in a knot to make sure it doesn't come loose. At night and from a distance, the fishing wire should barely be visible, giving the illusion of floating ghosts. To section off your ghostly gathering and keep trick-or-treaters from any close encounters with the monofilament, surround the scene with low fencing. This is exactly the effect you're after - ghosts that appear to be floating in mid-air. It's an exciting, "uplifting" sight, and is a cinch to pull off.